Wallabies are a kangaroo in miniature. On the southern edge of Tasmania sits Bruny Island, roughly 50 km long and pretty much untouched by man. 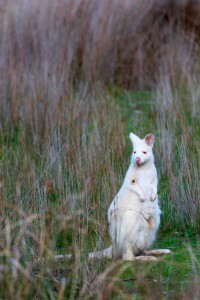 It’s home to a rare albino Bennetts wallaby, which is a more densely furred subspecies of the red-necked wallaby found on mainland Australia. I’d heard of this rare animal but had never had a chance to see one in the wild. Recently, I had an opportunity to go to Tasmania so I booked into adventure bay camping grounds and was determined to spot and photograph this marsupial. With a little local advice, I was able to find them and spend a great session watching and photographing them. 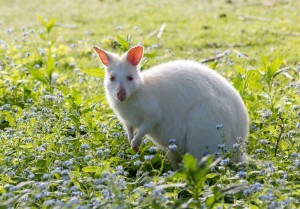 The albino wallaby would normally be predated fairly quickly in the wild, This is because the white coloration stands out like a beacon against the darker undergrowth. But on Bruny there are no predators so they thrive and breed. 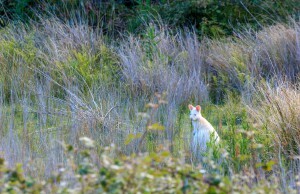 The albinos number around 200 animals. 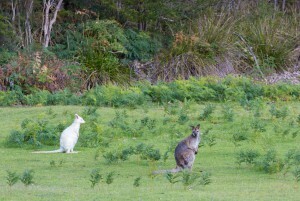 Here an albino can be compared to a normal colored wallaby. On Bruny, both types breed together. It’s not unusual to see an albino mother carrying a brown colored joey in its pouch. I was also lucky enough to capture two bucks fighting each other. Unfortunately, I had my camera set for a slower shutter speed so wasn’t quite ready for the fast action, hence a bit of camera blur. 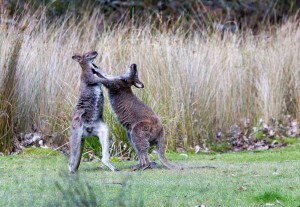 As far as fights go, this one was pretty tame, more of a practice sparring match really. 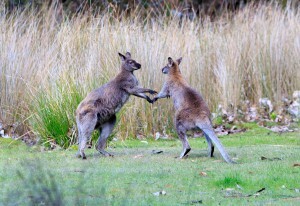 When these two stood on their hind legs they were pretty tall, considering they are wallabies. 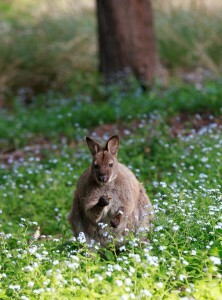 A normal colored wallaby among a field of flowers. A closeup of one of the not-shy animals. This little one posed very patiently for me to snap a portrait of it. Overall, I was very happy with how things went, the wildlife couldn’t have cooperated more and I know I’ll be back to photo these rare and beautiful creatures again in the future.